On my 80th Birthday, after the lunchtime meal, I was presented with an envelope which said, 'A Gift With Pleasure Flights Ltd'. How brilliant. It was a present from the children, grandchildren, and great grandchildren. 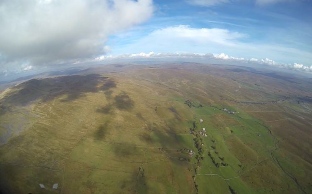 The flight was for 30 minutes touring the Yorkshire Three Peaks and Dales on the 5th October 2014 and the weather was perfect. When we arrived, as I checked in, we were told that there was a spare seat on the flight did we know of anyone who might like to buy it? My wife, Margaret, was with me so we jumped at the chance. 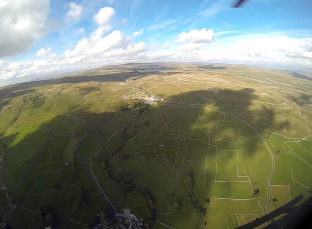 We took off at about 2.00pm from The Craven Arms, at Giggleswick near Settle. 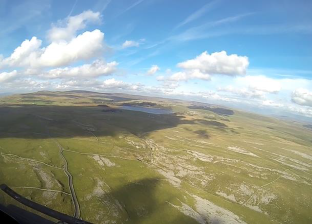 First we headed towards Ingleborough passing over Austwick and Clapham. After viewing Ingleborough and enjoying a view of The Ribblehead Viaduct we headed to Whernside observing walkers on the peak. Heading towards Pen-y-Ghent down the Ribble Valley we were treated to a silhouetted view of Ingleborough with Simon Fell in the foreground and then followed the railway line running along the valley and Selside Shaw Old Lane. 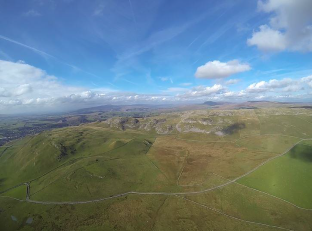 Across the valley lay Horton in Ribblesdale and Horton Limestone Quarry. 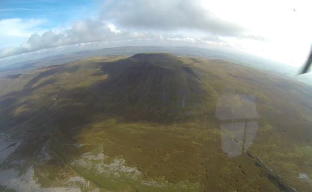 We had a good view of the Shake Holes on Pen-y-Ghent and of Pen-y-Ghent itself. Following the Pennine Way we passed Fountains Fell across Malham Moor to Malham Tarn and Gordale Scar. 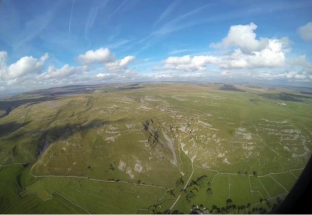 The flight then took us to Malham Cove and via Kirby Fell and Rye Loaf Hill back to Settle. It was a memorable experience and one which I will relive many times as I look at the photographs and video pictures. The views were to die for. The cloud formations were beautiful set against the blue sky. Probably, for me, the favourite part of the trip was to see peaks which I had climbed, from a new and more comprehensive perspective. Margaret was particularly thrilled as she had no idea that she would be on the flight until half an hour before take off and she loves the Dales. We can now recall our memories together. 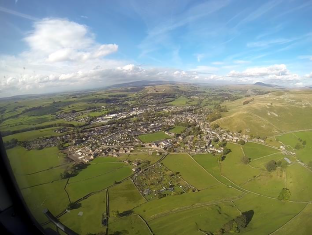 Flying with us was a young man with his dad and you could tell that they thoroughly enjoyed the experience. The flight would obviously make a fun family day out. Although one was conscious of being in a helicopter the noise was no problem at all. The staff were very friendly and helpful as well as being efficient and safety conscious. Looking forward to my 90th Birthday! Michael Bland, Gargrave, North Yorkshire.